Monday - Sunday's run left me feeling a little achy, so I contemplated skipping today's run. However, I was feeling pretty fresh after work and went out for a 3 mile run with Lucy. Felt great after. Tuesday - Went out for a 7 mile run with Lucy and wound up running ~8.5 miles. I maintained a comfortable pace and the run felt fairly easy. I finished up listening to The Dead, by James Joyce and started listening to The Hunger Games, by Suzanne Collins. Wednesday - 6.25 mile run. I only had 3 miles on my training schedule, but I've been enjoying listening to books and I was thinking about the looming time change, which will leave me to run in the dark after work, for a few months. 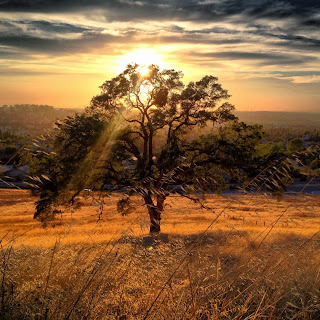 I decided to head out to run on my favorite local (easily reachable from my doorstep) trail, which is always at its best during a good sunset. Additionally, I thought to myself "it's tarantula season, maybe I'll get lucky". I was not disappointed on either front (sunset or tarantula)! I wound up with a photograph that is currently being matted and framed in a ~20" x 30" frame and I got to pet and hold, not one, but TWO tarantulas! 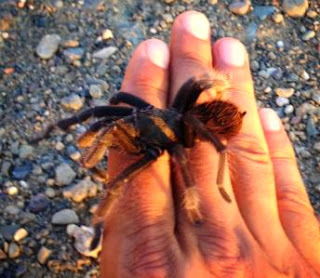 Note: don't hold tarantulas, they're very fragile and can be easily harmed, they'd probably appreciate it if you just leave them the hell alone. I just couldn't resist! Oh, and I knocked out a couple more chapters of The Hunger Games. Thursday - Hit up a local middle school for 5 x 800 m repeats with 400 m recovery jogs + a little warm-up and cool-down. 6.63 miles total. I ran the 800's in 3:16-3:30 (avg ~6:45 min/mile pace maybe). Saturday - Ran 9 miles with 7 miles at my GMP (goal marathon pace - 8:30 min/mile). The workout felt tough, particularly the last couple of GMP miles. Weekly Totals: 43.74 miles; +2,717 ft. He (I'm confident it was a male, at age ~7, they go out exploring for a partner during fall evenings) was very gentle and timid, hiding under my hand instead of walking across it. The NFL is back; unexpected company! Monday - Drove up HWY 395 on the way back from Southern Cal. I saw countless places where I wanted to run and explore, but I did not. I simply drove, until I got to Lone Pine, where I ate and went to the bathroom; then again until South Lake Tahoe, where I ate and went to the bathroom again. Wednesday - 4.3 mile run with Lucy. Saturday - 7 mile run on a 100 degree day, hot! I got home, cleaned up, re-fueled, and headed over to a friends house to enjoy the San Francisco 49ers game! Weekly Totals: 37.7 miles; +1,798 ft. I didn't really tear it up with the camera this week, but I feel obligated. Here's a really green smoothie: chocolate almond milk, orange juice, Chocolate Vega Performance Protein, spirulina, ginger, cayenne pepper, tumeric. I drank 3 pints of it. Let the CIM training begin! I'm focusing on running my least slow marathon EVER at the 2013 California International Marathon (CIM). In order to make that happen, I'm kicking off a 15 week training plan, based heavily on Hal Higdon's "Advanced II" plan (I'm starting on the 4th week). I don't feel like I've ever really "nailed" a marathon and I'm hoping to do so this year. Historically, when I've trained specifically for a marathon race, for some reason or another, I've under-performed on race day. My 3 fastest marathon times have come during marathons that I was running as training runs for longer races. For example, my current marathon best is at the 2013 LA Marathon, a race I ran the week after a 60 mile week, 7 days after having run the Way Too Cool 50k. So, here it is... key workouts will be speed/hill workouts on Tues/Thurs, goal marathon pace (GMP) runs on the weekends, and of course the staple of any good marathon training plan, the long run. Tuesday - 6.3 M run w/ 4 mile tempo. I felt really good on this run. I ran on a local trail/fire road, 700+ ft of elevation gain and kept my tempo miles in the low 8 min/mile and high 7 min/mile range. Friday - Rest day, drove to Southern Cal to spend the weekend with family. Saturday - 6.6 miles at GMP, w/ Lucy. I ran this a hair too fast, aiming for 8:30 min/miles and averaged 8:15 (slowest was 8:26). The Temecular/Wildomar area was experiencing east coast style humidity. Temps were in the 90's and it was muggy! Sunday - 13.1 mile run. I felt great during the first 5 miles and then the heat caught up with me, resulting in a fairly uncomfortable trudge during the latter half of the run. :) Happy birthday, Mom! Lucy, keeping comfy on the road trip. She loves the added room that the double cab has to offer. Happy 70th birthday, Mom and Dad! Tired after running, swimming, and playing with Mia all day. Napa Valley Half Marathon: much different plan!